Mortgage rates are the heartbeat of our business, offering the greatest insight into whether homeownership is affordable. So it’s no surprise that when headlines scream that rates are on the rise while others declare that rates are historically low, borrowers have questions and concerns. Historic context is key to understanding how rates behave. The downward trend of rates the last 20 years proves that buying a home truly is a better option than renting. Here’s how. First, what are mortgage rates? Just like any loan or line of credit, mortgages come with interest, which, of course, is the cost of borrowing money. A host of market factors beyond the lender’s control determine what those rates are, including activity on the bond market and how apt investors are to buy mortgages bundled as securities. This process and how it plays out on the secondary mortgage market is intricate. Check out this blog to learn more. Now, the history lesson. Here are three things you should know about the nature of mortgage rates over the last two decades. We’ll use the 30-year fixed-rate mortgage as a benchmark since they’re the most popular home loan option in the U.S. and often used as a basis for news and research findings. Take a look at this chart from one our traders here at Movement. This chart shows the ebb and flow of mortgage rates over the last 20 years. It shows that rates on 30-year mortgages peaked at just over 8 percent in 2000; they were as high as 18 percent in the early 1980s. Rates have been on a steady decline over the last 20 years. Sure, there have been ups and downs — the most dramatic of which was the credit crisis that drove rates to historical lows. But rates, overall, are influenced by economic activity, inflation and monetary policy. 2) Buying a home was a bargain back then. It still is today. Need proof? Let’s crunch some hypothetical numbers. In June 2000, the median price of a home was $140,000 and the rate on a 30-year mortgage was 8 percent. If a borrower financed this at a 90 percent , the principal and interest payment was approximately $925 a month. Compare that to 2017 when the median price of a home is $245,000 and the 30-year mortgage rate is 3.8 percent. If a borrower finances this at a 90 percent loan-to-value, the principal and interest payment would be approximately $1,025 a month. This shows that in the span of 17 years, the average mortgage payment has increased by just $100 on principal and interest only. This does not take into consideration property taxes and insurance, which vary across different states. Rental rates, meanwhile, continue to rise with no sign of slowing down. Last year, the Wall Street Journal reported that rent in 2015 increased 4.6 percent to approximately $1,180, up from $1,125 a year earlier. Put that in perspective: Rent went up about $60 in the span of a year, exceeding the average cost of a mortgage, while the cost of owning a home went up $100 over a much longer timeframe. The bottom line: Homeownership over time is a better investment and more affordable than renting. 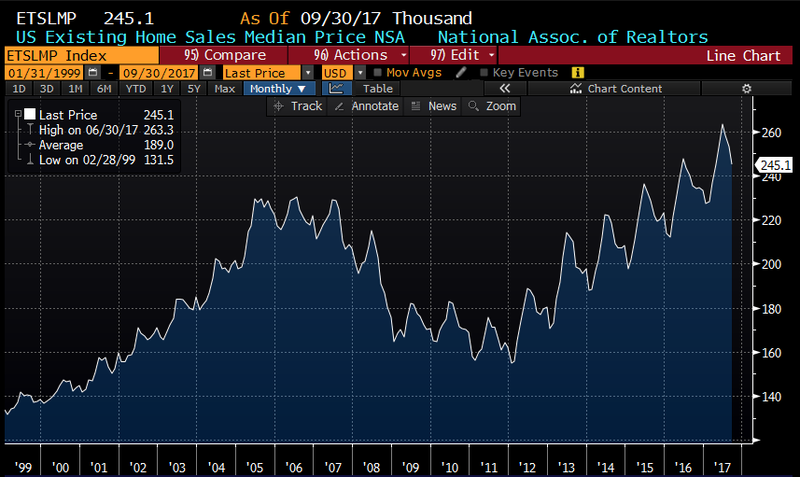 Median sales price for existing-home sales since 1999. Courtesy of Bloomberg. It’s inevitable. As the economy strengthens, mortgage rates are going to rise, potentially reaching 5 percent by 2019, according to the Mortgage Bankers Association. The Fed’s changing of the guard will influence rates. In February, Jerome “Jay” Powell will succeed Janet Yellen as the Fed chair. Powell shares a similar cautious outlook on rates as Yellen. But he also favors deregulation, which should help the economy grow faster. That will cause rates to go up. And as the economy expands, which it seems poised to do, the Fed will hike rates to balance growth and inflation. Rising rates will impact total mortgage originations next year. What does this mean for Movement? The MBA currently forecasts that total originations for 2018 will decrease by approximately $90 billion to $1.597 trillion. However, purchase money mortgages will increase by approximately $80 billion to $1.167 trillion. This makes for a great opportunity for Movement Mortgage as more than 90% of the loans we close are mortgages to purchase a home. This week saw the release of monthly data that gave us insight into inflation. Let’s take a look. CPI: The Consumer Price Index rose 0.1 percent in October as the bump in gasoline prices a month earlier began to subside. The CPI measures changes in the price of consumer goods. Gas prices fell 2.4 percent after rocketing 13.1 percent in September, its largest increase since June 2009. PPI: S. producer prices rose 0.4 percent last month, beating economists’ expectations of 0.1 percent. The PPI, or Producer Price Index, details the average change in selling prices from the perspective of domestic producers. A rise in food prices propped the PPI in October, creating the biggest yearly increase in wholesale inflation in nearly six years, according to CNBC. Retail sales:S. retail sales rose 0.2 percent, exceeding the expectations of analysts who didn’t expect a change from September to October. Why the bump? Economists believe a boost in the purchase of motor vehicles elevated retail sales as consumer spending remained fairly strong throughout the third quarter. Let’s take a break. I hope you all have a wonderful Thanksgiving surrounded by friends and family, good food, football and, if it’s your thing, a bountiful Black Friday (check out this fun quiz that’ll tell you what kind of Black Friday shopper you are). Enjoy the holiday. Market Update will return Dec. 1.